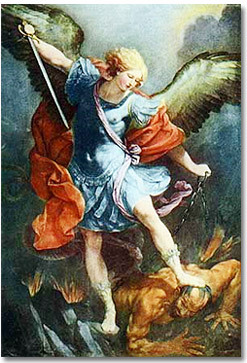 My I Am Presence - Who is Saint Michael? Thus, call to me daily! Thus, invoke the violet flame daily! For when you call to me, I summon the Archangels and their legions (all of whom are under my command) and they respond with dispatch. We are here to balance the forces of life deep within the earth and on its surface. For we are laying the foundations of the age of Aquarius, and in Saint Germain's name we will do all in our power to make it a golden age! We are counting on the victory of the golden age!